In honor of our dear teacher Rima, I wanted to make a traditional Lebanese dinner. I did some research and these are two of Lebanon’s most delightful dishes. 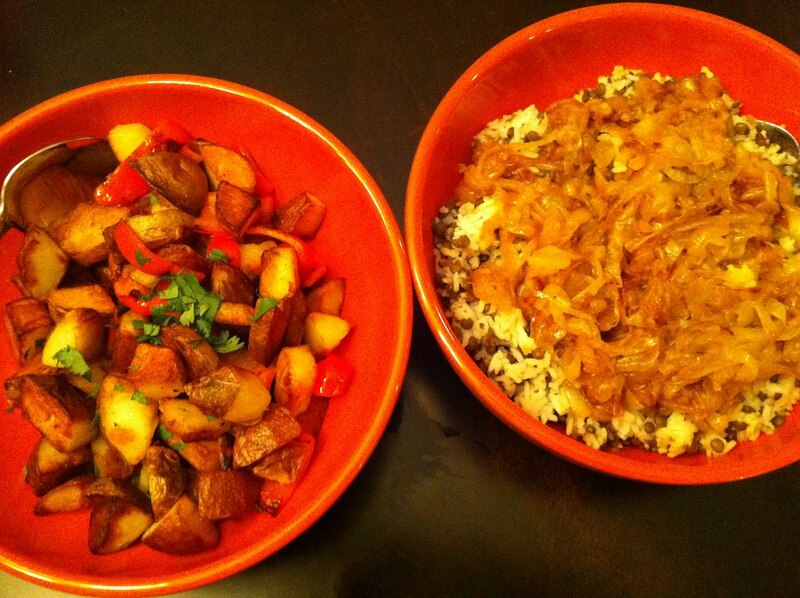 The Batata Hara are simple, spiced potatoes (I am sure they are way spicier in real life) and the Mujadara is lentils and rice with carmelized onions (this is so easy, it isn’t even a recipe.) Try it! Start by slicing up the onions, and get them going with olive oil in a big pan with sides. Caramelizing usually takes about 30 minutes so be prepared and time it well. Cut up the potatoes. In a non stick skillet, heat up safflower oil and get the potatoes going. Add in garlic and chili powder, and salt and pepper to taste. These potatoes take some time to get nicely brown and crispy. Turn them often. When the are almost done, add the red pepper and just cook it until it is just getting soft (we like it be a little crispy.) Pour into a serving dish and sprinkle fresh cilantro on top. Cook the lentils and the rice separately. When done, mix together and place into a serving dish. Add the caramelized onions on top. Such basic ingredients and so tasty. Enjoy!